The stifling heat that settled over San Diego County this week will persist Thursday and last at least into early next week, according to the latest forecasts. The National Weather Service office in San Diego said the high-pressure system causing the record temperatures is now stationary over the western United States. Temperatures could dip a few degrees Thursday, but with triple-digit heat in the forecast for much of the county and temperatures 10 degrees above average for late August, the slight cool-down will be almost imperceptible, the weather service said. And any slight drop in temperature won’t last long — forecasters said Friday and Saturday will see the mercury jump back up several degrees as the heat wave is expected to last longer than previously thought. The forecast has prompted the weather service to extend an excessive heat warning for the second time this week. Initially set to expire Wednesday, the warning’s expiration was pushed back to Friday night and now to Saturday night. That warning covers most of the county except for the mountains and beaches, where a less serious heat advisory is in effect for the same time period. 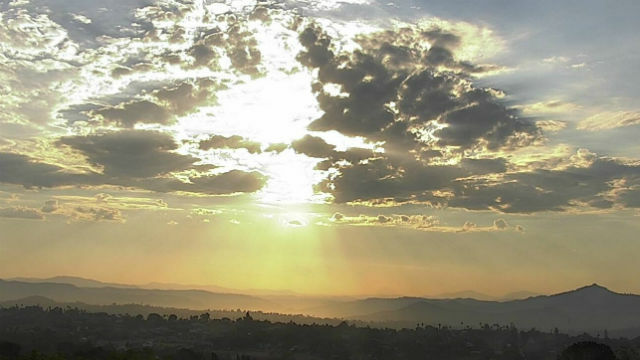 Rain and thunderstorms could accompany the heat Thursday, mainly in the mountains and deserts, as monsoonal moisture moves into Southern California courtesy of a tropical storm of Mexico’s west coast. Meteorologists put the chance of rain Thursday at 20 percent in San Diego County’s mountains and deserts. High temperatures Thursday will be 81 to 86 degrees at the beaches, 92 to 97 inland, 95 to 100 in the western valleys, 100 to 105 near the foothills, 94 to 100 in the mountains and 108 to 113 in the deserts.